A new event in The Garret – an author interview. 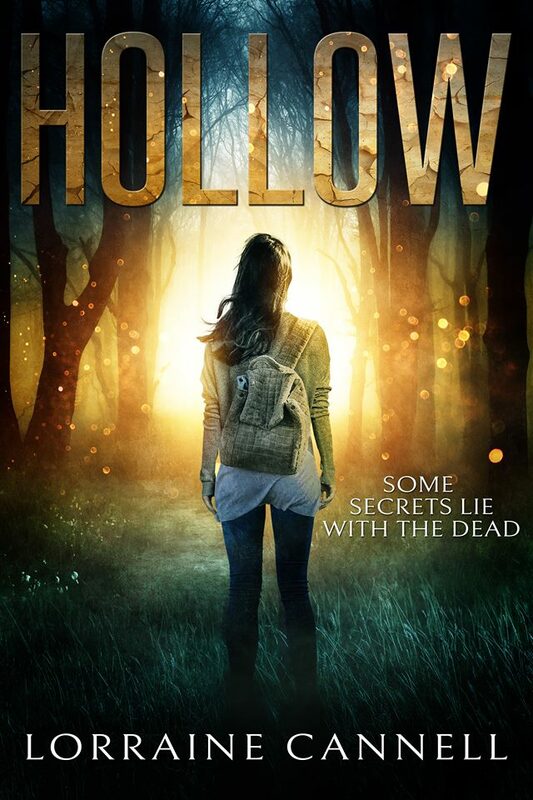 Perfect for those dark winter nights, here’s Lorraine Cannell answering questions about her paranormal thriller Hollow. Read on to discover Lorraine’s process and influence – and some juicy extracts . . .
Let’s start at the beginning, Lorraine – where did the idea for Hollow come from? The idea for Hollow began at the Winchester Writers’ Festival in 2013. One early morning, before the day had begun, an idea began to germinate – it involved Liv, a teenage girl with a psychic gift who was driven to help find the spirits of faceless girls, and a serial killer. I also knew that one of the spirits would be someone that the main character once knew. After a while, I thought about how much more compelling the story would be if there was an air of mystery around one of the faceless girls and a sense that somehow Liv knew her. And I decided to make her an amnesiac, the result of a traumatic incident – one that she has no memory of. I also wanted to create a web of secrets and lies around this incident and wanted to explore the extent to which families will go to protect the ones they love. This helped me to build Liv as an unreliable narrator and to take her on a journey of self-discovery. Not so long ago, when I didn’t know any better, I’d walk past the houses of complete strangers, and wonder at why they’d left their lights on, their curtains open. It felt wrong, watching these people in their homes. But then I started to notice things ­– in front rooms and kitchens. That it wasn’t just them, but their entire lives, their families on show. And it made me realise – why are there no family photos on our walls, or on the mantelpiece above the fireplace? Where are the tributes to my childhood, the hand-drawn pictures and certificates? It’s as if there never was a before me; as if I never existed. Once I had a sense of the over-arching plotline, I started world-building – to flesh out the details around the back-story to the traumatic incident and for the characters involved. And to figure out the implications of the past on the present. This involved creating a mind-map/dump of my ideas onto a big poster-sized sheet of paper. At the same time, I started to look for images. Some of my ideas come purely from images themselves, and a lot of my writing process is filmic – when I write, I imagine what my story would look like playing out on the big screen. My characters are also based on images of real people. Liv was originally based on Emma Watson. 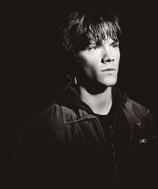 And if anyone watches the US series ‘Supernatural’, Dan is based on a young Sam (Jared Padalecki), although I’ll be the first to admit – I’m more of a Dean fan. what techniques did you find useful to deepen the story? As visuals are such a big part of my creative process, I always build a Pinterest storyboard for each of my novels. For example, in Hollow, the reader will learn that Liv has a fear of forests and trees. This fear links to a memory that is lurking deep in the Hollow – a place in her mind where all of her memories have long since disappeared. I’m reliving the first time I looked in a mirror and saw the face of a stranger staring back. 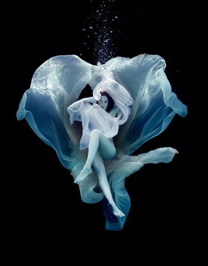 Reliving the moment I found the Hollow, and peered over its edge, seeking answers. But all I found was an uncompromising darkness, so black and solid it reached down, and knotted my insides. But it wasn’t enough for Liv to be afraid of the woods. For me, fear has to be three-dimensional and to go to the darkest place in our imagination. 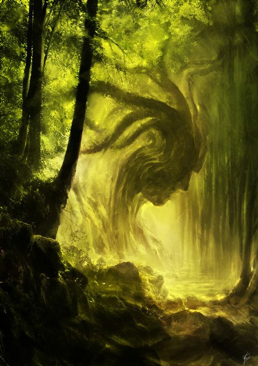 I found this image of a tree spirit and wanted to use a variation on the theme of tree spirits to elevate Liv’s fear but also to link it to her awakening. I’m stumbling through a forest and tripping on roots that grab at my feet. Every time I run past a tree, I swear there’s a face carved into the bark, eyes looking back at me, tracking my passage. And as minutes turn into hours, and dark turns to light, and then dark again, the trees – they whisper to me. My mouth is dry like sand, my feet tripping over themselves, too tired to go on. Liv. A voice calls to me. I swing around to the nearest tree, and with a tentative finger, I reach out and touch the bark. I trace its grooves, and suddenly the lines pop out like a pop-up card gone wrong. My heart is in my throat, my blood so cold that I take off on my heels again. I pass by another tree – dead, darkened limbs twisted into a grotesque pose. Liv. 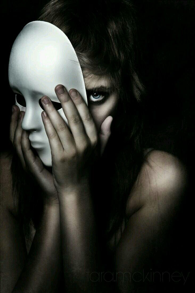 Don’t forget who you are. How did you create a sense of realism amongst paranormal events? There were also elements of Hollow which I borrowed from personal experience. There is that old adage about writing what you know, and the psychic circle and trance scenes are rooted in my own experiences. From an early age, I was exposed to spiritual influences. My mum used to take me to psychic fairs, and later, trained as a medium. As a teenager, I was a little embarrassed by this, and also highly sceptical of mum’s readings. But in essence, I was a believer. 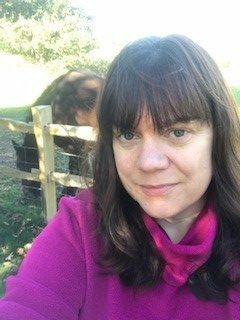 I’ve always thought that there are things beyond our understanding and beyond what we can see, and in my thirties, I joined a couple of psychic circles to explore that further. As a result, I leant heavily on my own experience of psychic circles and trances in order to bring an element of reality to Hollow. Although, of course, I used some artistic licence too. My eyes are still closed, have been for some time, and my lids have grown heavy. There’s a dense blackness in front of me that’s weirdly comforting, my consciousness drifting deeper. Dan’s still asking for spirit to come forward, but each time his voice seems further away. Even so, I can still feel the seat beneath me, my own physical presence; heavy, and full of a strange tingling I’ve never felt before. My hand, the one next to Ally’s, grows cold. There’s a great sense of place in Hollow – how did you set about conveying that? Once again, in an effort to make things as real as possible, I try to use familiar locations. I grew up in Chingford, East London, on the borders of Epping Forest. Everything about the school Liv goes to is based on the school I went to – Heathcote School – including the wooded area called Bluehouse Grove where kids used to climb through the fence. Every so often, a fair would come into town and fill me with excitement. My favourite ride? 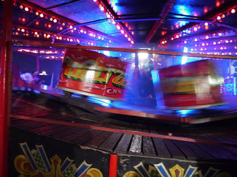 Of course, the Waltzer, and what better thrill than to be given a fast spin by some fairground guy walking the ramps. So, you see, a lot of what I write links to the past, and I think there’s something special about immortalising those memories. Ally’s biting her lip, half-smiling. And the car does a full three-sixty again, except this time it’s faster. I push my head back into the cushion and find myself looking into someone’s eyes. I don’t know why, but I’m getting a weird sense of déjà vu. I reach out with my hand and tap Ally’s arm and she twists her head too. It’s the boy who collected our money, standing at the back of us and he’s grinning. I also notice he has his hands planted on either side of our heads. Instantly I know that can only be a bad thing. Thank you for all those insights, Lorraine! If you like the sound of Hollow, (Longlisted in the 2017 Bath Novel Award) here’s the link to buy a copy. Available in both paperback and Kindle editions. Lorraine Cannell is a novelist, largely specialising in Young Adult fiction. HOLLOW is her first Young Adult novel and was long-listed as part of the Bath Novel Award 2017. She lives in a Kentish Oast House in the UK with her husband, three children and two golden retrievers. This entry was posted in Interviews and tagged Hollow, influences, interview, Lorraine Cannell, process by KMLockwood. Bookmark the permalink.